Since its founding, the Pacific Institute has been at the forefront of research on the impacts of climate change on water resources and on strategies to reduce those impacts. The water cycle and the climate cycle are inextricably linked. The movement of water is the primary way that energy is redistributed around the planet. And as temperatures rise, the flows of water in the hydrologic cycle will accelerate. Among other consequences, climate change will intensify the water cycle, altering water availability, timing, quality, and demand. Indeed, all of the major international and national assessments have concluded that freshwater systems are among the most vulnerable sectors of society to climate changes. Early work done by Pacific Institute staff highlighted the risks of climate change for regional water systems, especially those dependent on snowfall and snowpack. As early as the late 1980s and early 1990s, we briefed leading national and international policymakers on climate and water risks. Institute staff played a leading role in evaluating risks to the nation’s water resources as part of the first U.S. National Assessment. Some degree of climate change is now unavoidable. Thus, adaptation must be a central element of policy. 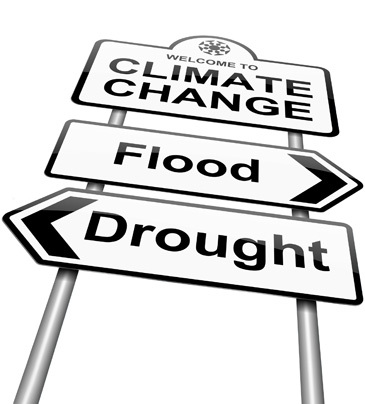 Adaptation refers to initiatives and measures to reduce the vulnerability of natural and human systems to actual and expected climate change effects. Water managers and farmers around the world already implement a variety of technologies and practices to adapt to current climate- and weather-related risks. For example, water managers implement water conservation and efficiency measures to reduce their vulnerability to water supply constraints. Farmers shift the timing and types of crops grown according to seasonal weather forecasts. But while it is important to build upon these strategies, we cannot assume that existing approaches are sufficient to adapt to future climate conditions. Action is needed now to improve our understanding of water-related risks from climate change and to explore and implement strategies to reduce these risks. The Pacific Institute works with diverse stakeholders to identify and develop water-management solutions that promote more resilient water systems in the U.S. and abroad. In addition to adapting to those climate impacts that are now unavoidable, we must also work to avoid severe climate impacts to which we cannot adapt. The good news is that the strong connections between water and energy offer some unique opportunities to both reduce greenhouse gas emissions associated with water management and build more resilient water systems. The Pacific Institute has worked with local communities, water agencies, utilities, and policymakers to develop and apply tools for understanding how integrated energy and water policies can help reduce greenhouse gas emissions and limit the ultimate impacts of climate change. Additionally, the Pacific Institute continues to work with stakeholders to identify and develop water management solutions that promote more resilient water systems in the U.S. and abroad.